Several passenger planes were involved in a serious loss of separation incident at Helsinki-Vantaa Airport, Finland. The Safety Investigation Authority Finland has started an investigation. 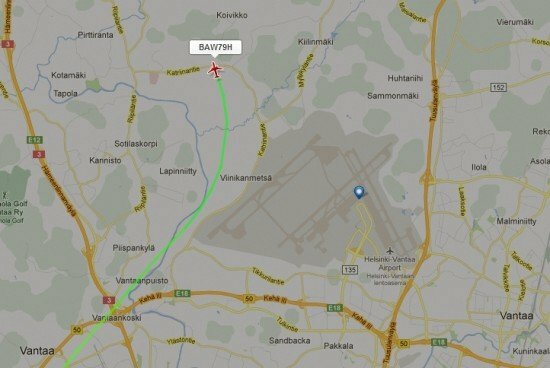 On February 6, 2013 at 16:00 local time three aircraft were on approach to runway 04L at Helsinki-Vantaa Airport, Finland. Norwegian Air Shuttle flight DY5863, a Boeing 737-800, was on finals, followed by a Flybe Nordic ATR, and a British Airways Airbus A320, flight BA794 from London. The air traffic controller noticed that British Airways flight was closing in on the ATR plane. To maintain a safe clearance between the aircraft, the controller instructed BA794 to abort the approach. At the same time the Norwegian Air Shuttle 737 had landed, but remained longer on the runway than anticipated by the crew of the ATR. The ATR crew decided to a execute a go around. This situation caused a breach of separation minima between the British Airways and Flybe aircraft. While the ATR executed a go around, an Blue 1 Boeing 717 took off from runway 04R. This situation caused a second breach of separation minima, this time betweent the Flybe and Blue 1 aircraft. There was no risk of collision according to the Safety Investigation Authority Finland, who classified this as a ‘serious incident’.